the SENGOKU - and the SENGOKU. 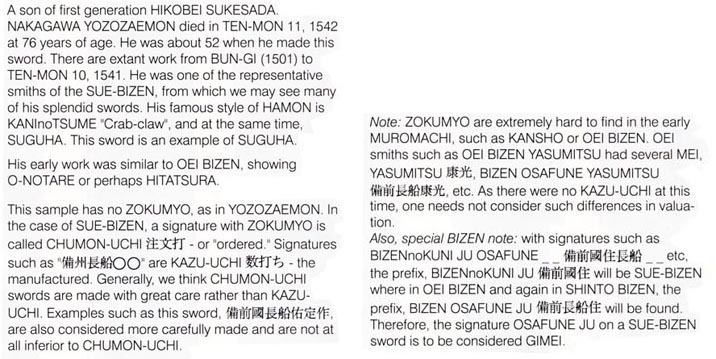 the SENGOKU, in their style, equal the great of any era. KYO-TOKU 1452 era in OSAFUNE. from KO-SHO to the 1st year of BUN-MEI 1469. SUGUHA, KO-MIDARE and CHOJI are seen. SUKESADA(1) MEI-O 1490: HIKOBEI. Son of CHOKYO SUKESADA. 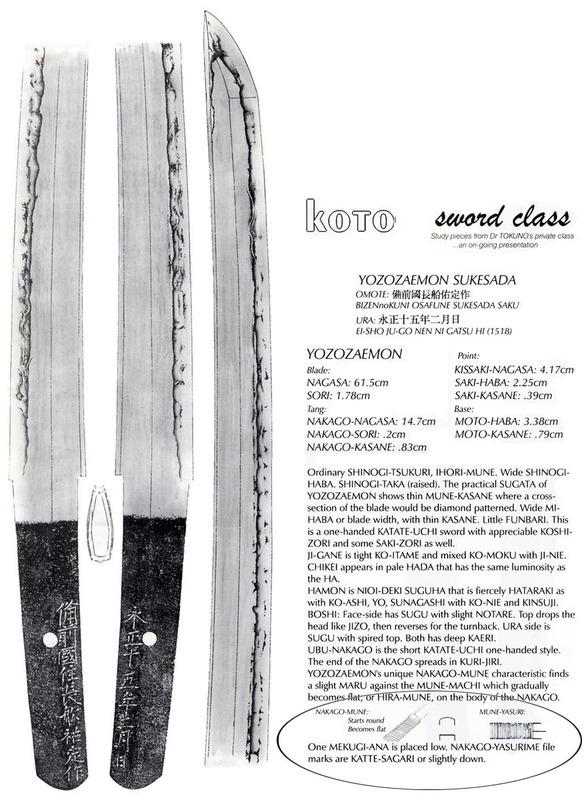 High-mark style brings the new era and foreruns YOSAZAEMON. seen. 7 to 8 Sun thick Kasane Tanto. Jitetsu is Ko-Itame Hada with standing Utsuri. SUKESADA(2) TEN-MON (f: HIKOBEI): HIKOBEI the 2nd, son of HOKIBEI(1). SUGUHA AND KOSHI-HIRAKI GUNOME CHOJI-MIDARE BA. Shinogi-tsukuri-Ihori-mune Koshizori Katateuchi going Sakizori to Chu-Kissaki. Bo-Hi So-bi walk together. Ko-Itame Hada with thin of JiNie. Kani Tsume fights the restraint of Yamagata Gunome mounds, evenly marching up the Ha. Nioi-Fukashi and Ko-Nie shroud an abundance of Ko-Ashi and Yo. Kinsuji and Sunagashi streak through the grain. Midare-Komi fills the Boshi, becoming deep on Ura. His Suguha Hamon is an intense Hataraki of Sunagashi, running Kinsuji and Ko-nie Hotsure. Ubu Haagri Kurijiri Nakago has one Mekugi-ana and slight Mune-niku with Kiri-yasuri noted. used SUGUHA in various works to place dynamic and artistic balance. There is much NIE JIBA that mingles with his UTSURI. high. Then we see the conservative balance of SUGUHA at play. 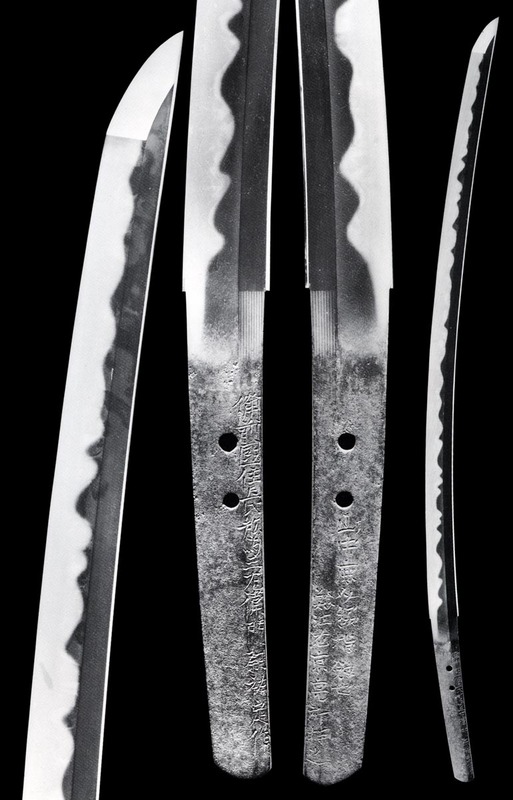 Koshi-Hiraki Gunome-Choji with Togari, Tama and Kani-Tsume Crab-claw Choji. Muneyaki falls down the back. Johan, first-half in Bizen Koshi-Hiraki Gunome with Tobi-yaki tossed in high-waving mounds to the Ji. Kahan, lower-half: A great Hiro-Suguha flows smoothly to the Machis. In Ko-Nie with Yo and the Nioi is Fukashi. 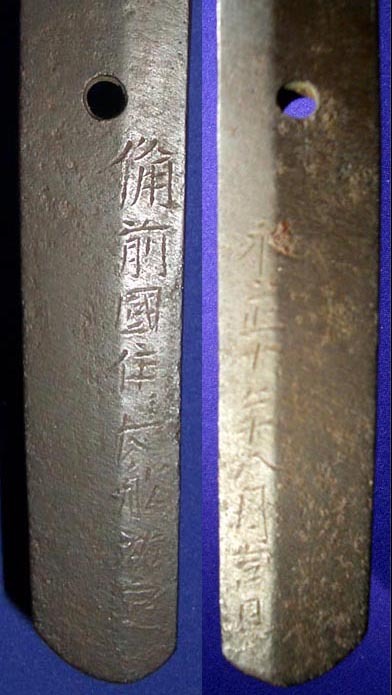 The easily recognizable pattern marks this singularly famous sword. 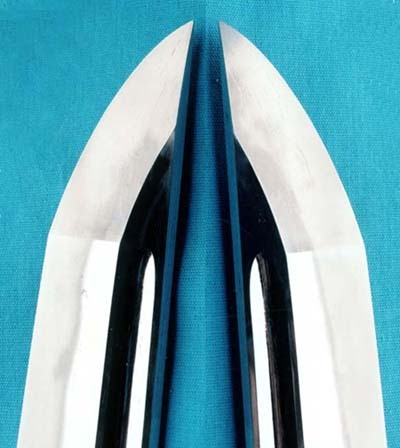 Shinogi-tsukuri, Ihori-mune, wide, strong Katateuchi Sugata with broad, elongated Kissaki. Yosa's Exuberant O-Gunome is unrestrained in this special order piece. Johan and Kahan are the same wildly waving and dynamic rises reaching the Shinogi and exploding across the upper. Ubu Haagari Kurijiri Bizen Nakago has two Mekugi-ana. Shinogi-Tsukuri with Bo-Hi through Johan to Maru-Dome. Strong Ashi and Yo exemplify high-standing Obusa and O-Gunome that crowd into undulating O-Notare waves sweeping through the Johan Upper. Kagemitsu-style Gunome Togari falls through the lower. Deep Nioi and Nie find Kinsuji and Sunagashi cutting through the Yakiba. Gunome with Kinsuji and Sunagashi on Omote, Sugu Suagashi Ura. Ko-Maru Kaeri. Typical Bizen Nakago in Kurijiri and two Mekugi-ana. 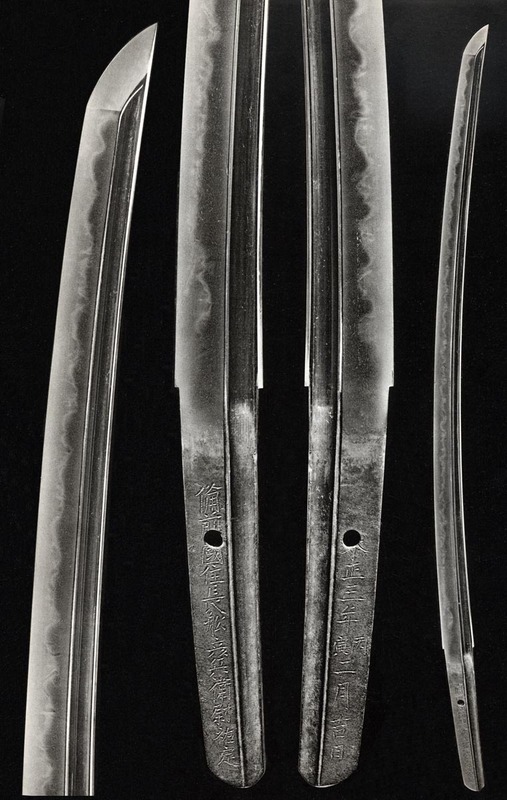 Hira-tsukuri, Ihori-mune, Muzori Tanto. Koshihi: Bohi and Gomabashi on Ura. There is a Kirikomi, Battle Scar on the upper Mune. Nioi and Ko-Nie Gunome-Midare with Ashi and Yo in his signature rippling Notare. Kinsuji and Sunagashi pulls Niju in the upper. Hakikake Saagari Boshi with deep Kaeri coming to Muneyaki. TEN-SHO 1573 time period. SUGUHA and GUNOME CHOJI-MIDARE BA. 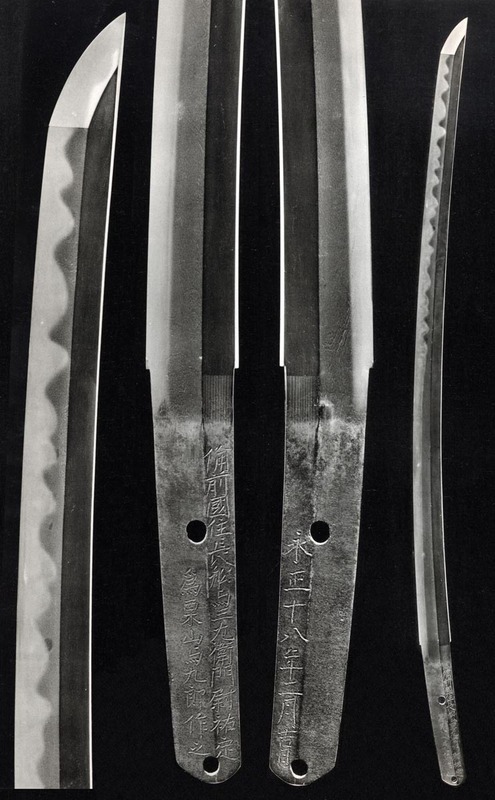 Shinogi-tsukuri, Ihori-mune of wide blade, Niku and raised ridge, Shinogi-taka with thin Mune-kasane. It has an elongated, round Fukura Kissaki. Hiro-Suguha of Ko-Nie. There are Ashi and Yo. Ubu Nakago has two Mekugi-ana, one filled. Signed in the Ji. 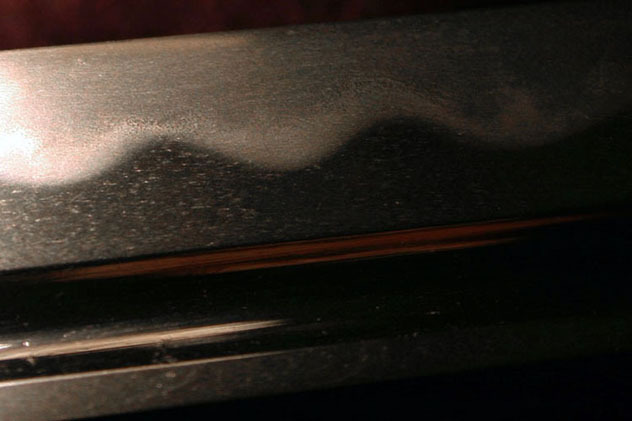 Well-knit and intricate Mokume Hada flows up the JI, marking the laminate next to the HA. Utsuri in the Ji. Tall, spiring Kani-Tsume "Crab-claw" Gunome Choji shows smoke Utsuri. Koshi-Hiraki wide-valleys in NIOI. 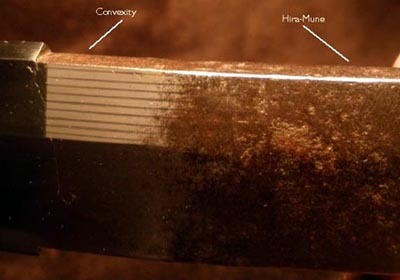 Sweeping Midare-Utsuri becomes Dan-dan over Bizen Itame. Ko-nie and Sunagashi sweeps Gunome-Midare O-Midare Ba. Hakikake and Kinsuji Sa-agari Boshi. Midare-Kaeri. Deeply curved with Chu-Kissaki. Koshi-Hi on both sides brings strength to the upper - Sugata for battle from horse. Itame Hada stands strongly through the Ji, while Masame runs in the Shinogi-Ji. Gunome Kani-no-Tsume "Crab-claw" Choji, Togari mix with Tobi-yaki near the Habaki-moto. Sunagashi swims and Kinsuji arcs. Boshi: Hakikake sweeps the Kissaki. Ubu Nakago, one Mekugi-ana, long Mei. Ko-Itame hada has JiNie that appears wet. A wide and exuberant O-Gunome and grouped Gunome Togari Midare in bright Nioi and KoNie. Kinsuji chases the line. KAGEMORI TEN-MON: ITAME HADA. GUNOME CHOJI-MIDARE BA.